Found one file extension association related to CatDV and 1 file format developed specifically for use with CatDV. Developer: Square Box Systems Ltd. Developer / company: Square Box Systems Ltd.
Apple's iLife apps are great for MP3s and digital photos but CatDV will do the same for movies and tapes. What's more, CatDV works down to the level of clips and scenes within a movie file or on a tape, described by their timecode, not just at the coarse level of complete files on disk. Don't wear out your tape and deck by shuffling it back and forwards as you identify the scenes to use and annotate them. Capture the tape to disk (in compressed form) and log from disk, giving you instant access to any portion of the tape. Use automatic scene detection to take the drudgery out of finding scene boundaries, or use the Verbatim Logger to type in comments, such as notes on the spoken dialogue or the text for subtitles, while the clip is playing - everything you type will automatically be linked to the appropriate timecode. QuickTime 7 is fantastic technology. It's much more than a file format but a complete set of components for creating and manipulating all kinds of media files (including MPEG-4 files and the amazing H.264/AAC codecs). However, not all its capabilities are available with the standard QuickTime Player application. 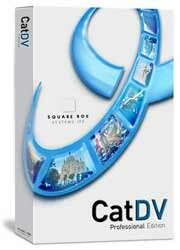 CatDV unlocks many of the same extra capabilities as QuickTime Pro: you can play movies, present them full screen, edit movies by assembling clips in sequence, and export them using any QuickTime codec (for example to use on the web, CD-ROM, or a 3G phone). If you have a video-capable iPod, use CatDV to generate iPod-compatible videos of all your key footage and take it with you, wherever you are. You might have video files coming in via FTP, or a tapeless camera such as the Sony XDCAM, often with metadata in an associated XML file. You can use CatDV's XML support, and features like watch folders, to build complex automated workflows that preserve your existing metadata, and allow you to add new tags and annotations, at every stage of the process. Mark and in and out points and quickly create a cuts-only sequence from the clips you've found, all from within your asset management database. Export your edited sequence as a movie, or send an edit decision list to Final Cut Pro (or other non-linear editing application) to finish the editing there. With CatDV you can quickly and easily add text tracks when exporting movies. Perhaps you want to add subtitles, the clip or project name, or protect your clips by burning in a copyright notice. You can even add a burnt-in display of the timecode or date and time of recording (in the style of a security camera). Use CatDV to export web pages with thumbnails and links to low bandwidth versions of your media files, perhaps to advertise a library of stock clips, or create a film strip version of an edited programme to show on your intranet. Got a file that won't play properly? CatDV's media analysis tool will display detailed information about the format of the file and individual tracks within it, even down to the durations of individual samples, helping you identify missing codecs, corrupt movies, or dropped frames. CatDV will even natively analyse many formats not supported by QuickTime, such as WMV/ASF and OMF files. Read more about CatDV's core features or some suggested workflows. Any one of these tools on their own could easily save you so much time that CatDV quickly pays for itself, but taken together they mean that CatDV is a completely indispensable tool for anyone who works with digital video and digital media files. What's more, it's completely cross-platform. Even if you only use a few of its features regularly, it's great to have the others available for those odd occasions when you suddenly need them. If you need more information please contact the developers of CatDV (Square Box Systems Ltd.), or check out their product website.